For a family stroll (about 35 mins) to counteract that big meal, or an energy-sapping power walk for the kids, take the northward path where Rushey Way meets Lower Earley Way at the Sindlesham roundabout. 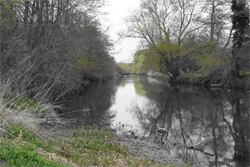 For a few yards this is parallel with Lower Earley Way and then skirts the west bank of the River Loddon, gradually moving away from the din of the traffic. Following this path, you eventually come to a flight of steps, (which would take you out onto the Wokingham Road). Turn left at the steps and follow the path in a circular direction to arrive back where you started. Pause when you get to the notice board there. It’s worth studying, being very attractively illustrated, with lyrical details on the past history of the area you’ve just circulated. For instance, did you know you are treading in the footsteps of very early man, or that people used to set up eel traps on the Loddon until the recent past? 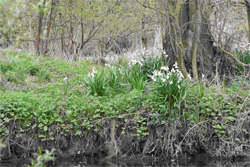 You may, as you walk along the west bank of the river, see clumps of Loddon lilies growing on the east bank, which perhaps survive because they are inaccessible. These were not identified as native flowers by early botanists, but “Flora Britannica” seems to suggest that, whilst some of these lilies may be garden escapes, where you get large swathes of them in inhospitable, damp, swamp-like conditions they may indeed be native plants growing in places where early botanists didn’t venture. 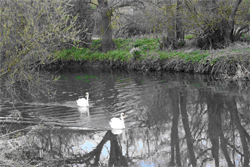 You can spot the lilies growing on the far bank in the swan picture.